Following the conclusion of Beaulieu Convent School Foundation’s first capital appeal, which has already delivered highly valued improvements to the School’s campus, a legacy programme has recently been inaugurated. Future legators who declare their provision for the School in their wills automatically become members of the Sine Macula Society and among other forms of acknowledgement a rose is planted in the school’s grounds. 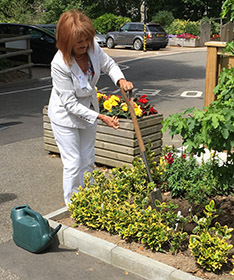 Pictured is the founder member the Society, Sheila Baker, planting her celebratory rose, a beautiful floribunda called Sweet Memories.